It's hauntingly scary out there! Bring the horror to life when the walls literally drip with haunting faces inside and out. 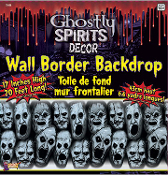 This twenty-foot long GHOSTLY SPIRITS Border Roll is just the thing to transform the ordinary into the stuff of nightmares. Gray plastic border sheet with creepy haunting scary spirit faces. Use this plastic border to create the scariest Halloween house on the block! Hang over doorway, window, or drape from rail, bannister or ceiling. Great additions to cemetery, graveyard, dungeon, torture chamber, witches den, scientist lab, mad doctor office, pirate scene, etc. Realistic, Scary, Spooky and Gross... Fresh Decor from a Creepy Haunted House! Goes anywhere... Great to display in entry or hallway!